I came across this recipe while reading Eating Well during one of my workouts and I couldn't wait to get home and try it. I'd never had sardines before, so I wasn't sure what to expect. It turns out I love them. And I'm expecting this recipe will become a summertime staple. It's quick, easy and light, perfect for a hot summer evening--and leftovers were a perfect lunch the next day. 1. In a large bowl, place all the dressing ingredients and whisk together until incorporated. Set aside. 2. Chop the tomatoes and cucumber into large chunks and add to the bowl, tossing to coat with the dressing. 3. Add the chickpeas, feta, onion and olives and toss again to coat all the ingredients. Either refrigerate until ready to serve or move on to step 4. 4. Divide the salad among four serving dishes and top each dish with 1/2 a can of sardines (about 2 sardine filets). Serve immediately. 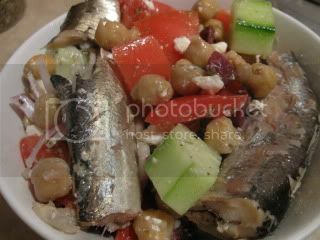 I only used one can of sardines (1/2 for dinner one night and 1/2 for lunch the next day) and I had the remaining salad without sardines as a side the next night and as lunch with some crusty bread the following day. The salad (and the dressing that goes on it) is really flexible. Have fun with it! As a writer I sit at a desk in front of a computer all day long. Even though I do my best to sit up straight and stretch now and then, by the end of the day my shoulders are tight and my back is stiff. I feel tension in my upper back and neck almost constantly. When I attended FitBloggin'10, I received an offer to try out this innovative self-massage kit and I couldn't pass it up, considering that I'm always looking for ways to get a free massage. Yoga Tune Up® is a head-to-toe health and fitness system combining Yoga, Calisthenics, Corrective Exercise and Body Therapy in a way that heals damaged muscle tissue, increases overall strength, and bolsters the immune system. They offer several kits to target different areas of your body, as well as full kit that includes the therapy balls and instructional CDs for all 5 target areas. I received the Neck & Upper Back kit, which included a set of two therapy balls in a mesh carrying bag and an instructional CD. After a long day at work, I quickly pulled out the balls and gave them a try using only the instructional booklet that came with the CD. The booklet contained illustrations of the positions and instructions on how to move to obtain the massage affect. Trying to do the moves without the audio instructions turned out to be a huge fail on my part, though. My placement of the therapy balls wasn't accurate and the movements hurt so badly I gave up half-way through the sequence. I didn't want to review the Yoga Tune Up system without giving it a fair shot, though. So after a couple of weeks, I pulled it out again and tried it a few more times, this time using the audio CD for guidance. The sequence was much easier with the added audio instructions helping me to find the correct placement for the balls. When I was finished, I can honestly say that there was much less tension in my upper back and neck and I felt much more relaxed. Now that I know how to use the Yoga Tune Up balls and have seen the positive effects, I'll definitely be using the system more often. It seems to be the perfect solution for people who spend their days at a desk hunched over a computer keyboard -- people like me. Disclaimer: I received a free Yoga Tune Up Neck & Upper Back kit. I am not, however, receiving any compensation for writing this post. The opinions shared here are solely my own, based on my personal experience with this product. I recently spent five days in Dallas for a conference. While I learned so much about the Technical Communication field and what other tech communicators are doing, I spent a good deal of my time in Dallas, socializing, eating, drinking and enjoying myself. And yet I didn't gain a pound. That's right. I chose whatever I wanted off the menu, ate until I was completely satisfied, enjoyed a few alcoholic beverages and only got to the fitness center two mornings of the five I was there, but I didn't gain any weight. In fact, I lost three pounds. At first, I was totally shocked by this turn of events. After all, I hadn't been obsessing about workouts or counting every calorie (or any calories, for that matter). I wasn't eating fruit and salads all day long. I didn't refuse a glass of wine with dinner or a beer at the social gatherings. I was walking everywhere. I wore my Gruve the entire time, and it turns out that I was burning so many calories my Green Goal increased twice by the time I got home from 10 days of traveling. I made healthy choices at most meals, but didn't deprive myself of treats. I may have had a few fries, a bagel for breakfast, or cream sauce on my cheesy enchiladas, but I balanced it out with salads, fruit, sushi and other tasty, but healthier, meals and snacks. I wasn't snacking all day and when I did eat, I was paying attention. While I carried a couple of healthy snacks with me at all times, I was too busy to think about eating them between meals. When we finally sat down to a meal, I was enjoying the dishes (and the company) so much that I ate them much more mindfully than I might at home on my couch. I was happy and less stressed. I was meeting new people, having stimulating conversations, learning new things and all-around enjoying myself. High happiness and low stress makes Ami less of an emotional eater. In almost perfect contrast, I spent the four days following my Dallas trip in NY with my family for Grampy's burial. Enter long car trips and gas station snacks; comfort food available almost 24/7; plenty of pizza, chips and donuts; emotional turbulence; a bit of family drama; and less exercise due to a busy schedule and cold weather. Those three pounds I lost in Dallas quickly returned. Being healthy, and even losing weight, is about so much more than just counting calories and sweating it out on the treadmill. I've always heard this, maybe even knew it to some extent, but I've finally got my own proof that it's true. I feel like I've turned a corner in this journey and I don't ever want to look back. When I attended FitBloggin'10 back in March, I met the two lovely ladies who run Twin Cakes Bakery, "Raleigh's first completely gluten-free, wheat-free, vegan, peanut-free, corn-free, soy-free, and casein-free bakery", and Pure2Raw, their raw, uncooked bakery. Now I admit, I was totally hesitant to try any of their products. My experience with "free" and raw products hasn't been stellar in the past. But when the twins, Michelle and Lori, provided samples of their baked treats and raw snacks for one of our snack breaks, I was pleasantly surprised. So surprised, in fact, that I emailed them and told them I'd love to review their products on my blog. As a wanna-be foodie who is always looking for healthy snacks, I thought this was the perfect opportunity to spread the word about my new discovery. Within days of emailing the twins, I received a carefully packed box of treats cushioned with recycled packing materials, because these girls aren't just concerned about the health of their bodies, they care about the health of the environment, too. I couldn't wait to get to work trying these snacks out. First up were the Pure2Raw flat breads. I had three variations to try: Purple Kale Onion, Swiss Chard Black Sesame, and Onion-free Spinach. My favorite flavor was the Swiss Chard Black Sesame. The sesame flavor was a great addition to the chard but wasn't overpowering. The Onion-free Spinach variation was an easy second favorite, with just a tiny hint of tang (vinegar, maybe?) and a perfectly balanced spinach flavor. The Purple Kale Onion flat bread was a bit too onion-y for me, and I love onion. The flavor was a little sweet with a bite, but the onion just took over. Overall, the flat breads were great. They were dry enough to give a little crunch, but not so dry as to be flavorless. They'd be great for mini open-faced sandwiches or topped with hummus. Next up were the Pure2Raw crackers. There were four varieties of cracker to try: Cheez, Rosemary, Collard Green Onion, and Pumpkin Seed Kale. Overall, the crackers were crunchier than the flat breads, as would be expected. Their flavors were fantastic and I liked them all. My favorite was the Rosemary cracker, with a flavor that was the perfect combination of savory and sweet. The Collard Green Onion was another favorite, with just enough onion that it didn't overpower the cracker. The Cheez and Pumpkin Seed Kale crackers didn't disappoint either. Their flavors were interesting without being too potent or strange. And I'm still trying to figure out how the Pure2Raw ladies managed to create the "cheese" flavor without actually adding cheese. Finally, I got to dessert: a Gluten-free Vegan Chocolate Chip Cookie, a Raw Brownie Bite, and a Mint Chocolate Bite. I'd take any of these desserts any day of the week. The Chocolate Chip Cookie was surprisingly good. It wasn't soft, but it wasn't hard either -- the perfect chewy texture and chocolaty sweetness. The Raw Brownie Bite had a great dark chocolate flavor with a hint of coconut. The texture was chewy and the flavor was lightly sweet, the perfect fix for any chocolate craving. I saved the Mint Chocolate Bite for last because it's what grabbed my attention at FitBloggin' and prompted me to write this review in the first place. I love mint and it's addition to the Brownie Bites only makes them more perfect. After having the opportunity to try some of Michelle and Lori's wonderful products, I'll most definitely be ordering from them in the future. If you're in the Raleigh area, stop by and say hello at the Carrboro and Durham farmers markets on Saturdays. And if you're not lucky enough to live nearby, you can always check out their products online and order from there. Thanks to the twins for letting me check out their products and share them with my readers. I wish them the best of luck in their business. We could use more innovative bakers like them! Disclaimer: I received free samples of the products mentioned in this post from Twin Cakes Bakery. I am not, however, receiving any compensation for writing this post and all opinions expressed here are solely my own. Somehow, two weeks have gone by since the start of the Fit 'N' Healthy Challenge. That's what happens with life. It's unpredictable and, occasionally, overwhelming. Get 30 minutes of moderate exercise 5 or more days a week. While I was at the STC Tech Comm Summit in Dallas the first week of May, I was an exercise machine. I walked everywhere I went, and I even made good use of the Hyatt fitness center a few mornings. In fact, I did so much walking and exercising that my Gruve Green Goal skyrocketed more than a hundred calories from the previous week, and I managed to get at least 30 minutes of exercise 7 of 7 days. Once I got back to my normal routine, though, getting to that Green Goal has been a bit more difficult. I've still been exercising at least 30 minutes most days, but without all those extra opportunities during my day and with the demands of my extremely sedentary job, it's been a struggle. I'm looking for more ways to add activity into my day, though. If I could do it while attending a conference where I sat in educational sessions all day, then it's clearly possible. I just need to figure out how to translate all that activity into my real life. So how are you doing with your Fit 'N' Healthy goal for May? I hope you're reaching your goal, but if not, I hope you're still trying. Every bit of activity makes a difference. If I haven't learned anything else wearing this Gruve around, I've learned that. Whatever you do, don't give up. Just keep moving! April is over and I hope everyone who joined me in my Active April Challenge met their goals, or at least made some progress toward them. Thanks to that check in last week, I did! Now that May is here, I wanted to take on a new challenge, so I’ve decided to take the idea behind Active April and morph it into a monthly challenge that I could adjust based on changes I want to make in my life -- changes that will improve my health, fitness and overall wellness. I'm calling it the Fit 'N' Healthy Challenge. 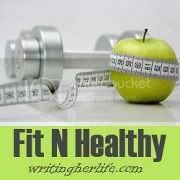 The goal of Fit 'N' Healthy is to make and work toward one fitness, health or wellness goal each month. At the beginning of the month, I’ll offer up a goal that we can all work toward and throughout the month I’ll check in to make sure we’re all on track. If the monthly goal speaks to you, feel free to jump in and join us. Just leave a comment letting me know you’re trying to get fit and healthy, too. If the goal isn’t for you, don’t worry. You can still join in. Set your own goal for the month, post it in the comments and we’ll cheer you on as you work toward your goal, too. That’s it. You choose the activity, so long as it gets your heart pumping. The 30 minutes doesn’t have to be consecutive, but let’s aim for at least 10 minutes at a time. Are you in? If so, you can check back here to report your progress and/or tweet about your progress using the #fitNhealthy hash tag. 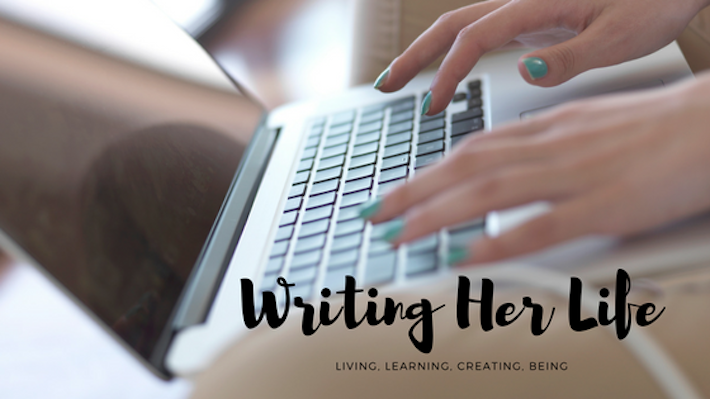 You can also grab the Fit ‘N’ Healthy button below to put on your blog. Let's get Fit & Healthy!